Growing basil in your garden, raised beds, in a pot or even indoors, is easier than you might think! Having fresh basil anytime you want is great for your kitchen and even has some medicinal purposes. Today we’re talking everything you need to know about growing basil! The only problem I’ve ever had growing basil is using it all! Before we get into the nitty gritty about growing basil in your garden, let’s talk basil varieties. There are types of basil you may never have even heard of, but you should considering adding them to your herb garden. Basil is a fairly easy herb to grow with very little soil requirements. Make sure your soil in enriched with some good compost, plenty of drainage with a pH of 6 or 7 ( what is soil pH? ). I prefer to start my basil plants indoors and transfer them to my raised beds or pots when the soil will stay warm. When starting seeds you only want to lightly cover with soil and keep the soil moist during germination. You can certainly start your basil with an established transplant from a garden store as well. Basil should be planted where it will get at least 6 hours of sun and 12 to 18 inches apart. I have found the more space you give basil, the bigger it gets! Your growing basil should need little to no additional fertilizer as it a light feeder. It likes moist soil but do not let it get soaked too often because this can lead to root rot and fungus. Basil can occasionally have pests like aphids but generally the biggest issue with growing it is making sure the soil isn’t soaking wet for too long. Basil will do very well in a container. Make sure your pot can accommodate a large basil plant. The pot should have good drainage as well and be set in an area that gives it the 6 – 8 hours of required sunlight. You can grow more than one variety of basil in a single container if it is quite large. You can also grow basil indoors! Again you’ll want a larger pot with good drainage. Keep your indoor basil where it will get adequate sunlight – in a windowsill or near a sliding glass door should work if sun comes in for at least 6 hours there. Your basil plant may require re-potting because they grow quickly and get large. Keep an eye on it. One of the most wonderful thing about growing basil is the ability to continually harvest the leaves! You’ll want to harvest your basil when you plant is over 6 inches tall and has some leaves to spare. Simply pinch the leaves, gently, from the stem. You can also use scissors but I find pinching goes much faster. You should also pinch off flowers from your basil plant to keep it producing leaves. Pinching the flowers will also encourage the plant to get fuller as well. You’ll want to harvest all the basil leaves before your first frost! Don’t worry, it is an annual so it will come back! Once you’ve harvested your basil you’ll need to store what you do not immediately use. Keep Fresh Basil in your fridge is best done by putting them in a mason jar and covering them loosely with a plastic bag. This should keep them fresh for a week or so. Freezing basil is a wonderful way to preserve the fresh flavor! Wash the leaves then blend in a food processor with just enough water to make it a puree. 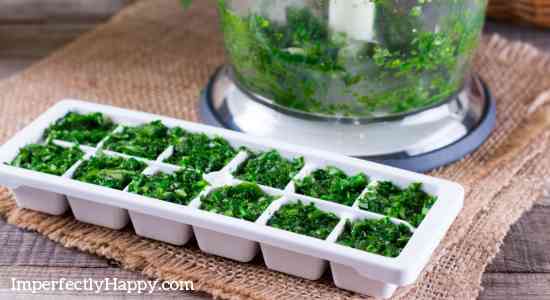 Pour the basil puree in to ice cube trays and freeze. Once frozen you can pop them out and put them in food storage bags for later use. I recommend using silicone ice trays for this task. Basil can be a wonderful companion plant for your vegetable garden! Plant near your bell peppers, beans, beets, tomatoes, asparagus, tomatoes, cabbage and eggplants. Basil will make your tomatoes taste even better! 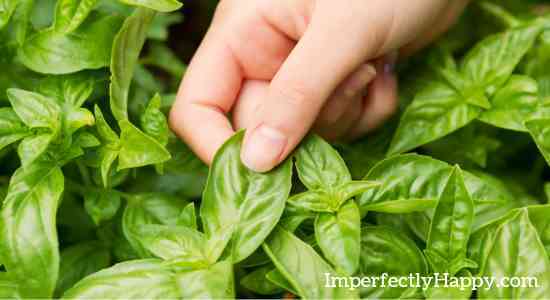 Most people think pesto when it comes to fresh basil. And pesto is amazing! But you can use it to make infused oils, in your salads, as a pizza topping, and to add lovely flavor to chicken and seafood dishes. Using fresh basil will always give you the most flavor; much more than dried basil. Basil is said to be a powerful medicinal herb with many uses. Learn how to use herbs as medicine! 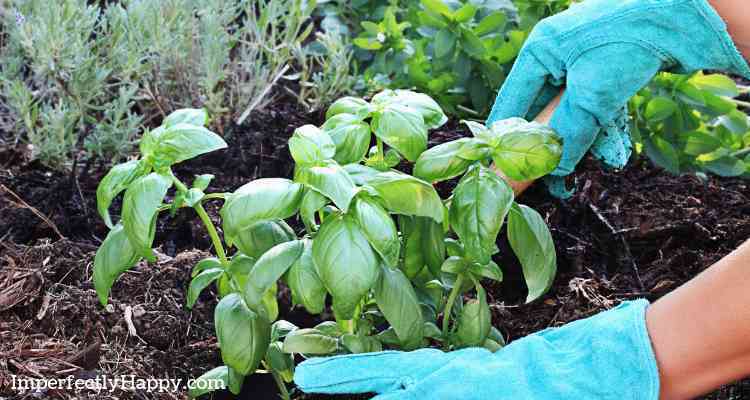 Growing basil in your herb or vegetable garden is really beneficial. 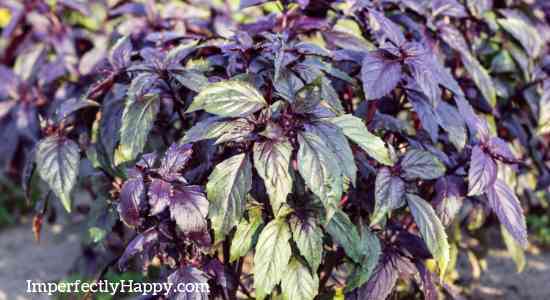 It is a hearty plant that will give you more than enough basil for your dishes all year long!